Roto Grip continues their winning streak with the Winner Solid bowling ball. This ball uses the Altered Hotshot core wich was designed to offer the length and reaction needed at the HP2 performance level. The VTC-S18 Solid coverstock provides traction down the lane without reacting too early. This ball is best used on medium to medium/heavy oil conditions when it will clear the front part of the lane easily and then give ample backend motion. When I got the chance to test the Winner Solid it was after leagues had finished. The lanes were pretty burnt up which was desired since I had preconceptions of using the Winner Solid on transition. The feedback I saw from the testing was that it was smooth rolling and controllable, however; it did get down the lane further than the other balls available in the Storm/Roto lineup. This is mainly due to the higher RG of the ball. I liked what I saw from the Winner Solid as I generally have a favorability to throw solid/surfaced benchmark bowling balls. I plan on incorporating this ball into my arsenal immediately as it will give me a ball to jump to when my lower RG or Asymmetrical balls are no longer matching up and the need arises to jump to something less aggressive that will store energy and give me motion down lane. My specs are 16.5 mph ball speed with about 285-315 RPM rev rate. New axis pts are 4 1/2 > 1/2 ^. I need my tilt and rotation checked but it used to be around 15* tilt with 35* rotation. Tweener with softer speed is my style. I drilled up my WINNER SOLID with a benchmark layout for me of 65 x 4.5 x 35 with no hole. I left it box finish to try it out first before adjusting. Early opinion is smooth rolling with good push in the fronts. Obviously the shape in the back was very close to the original WINNER when it made it's move. I have only used this on house and it is great for getting close to the oil line and letting the side and back end friction of the lane correct it to the pocket. This is not the heavy oiler the SHOW OFF was. Different cover on the WINNER SOLID compared to the SHOW OFF even though the shape of the weight block is the same (except for the puck on the bottom which increased the diff on the WINNERS). Compared to some current balls, the WINNER SOLID is definitely about 6 and 3 right of my PHYSIX. My HYROAD X even with the shine knocked off is still stronger and the HYROAD X specs are weaker compared to the WINNER SOLID. My HALO is about 6 and 3 stronger as is my IDOL SOLID. No surprise as we are comparing apples to oranges with the stronger covers/cores in the Storm family. I will say the HYROAD X having a stronger move at the spot was my biggest surprise but the cover should be stronger also on the HYROAD X. Drill this one up if you are looking for something that clears the fronts easier than the stronger balls but does not float like a Pearl can tend to do in this spot in the Storm/Roto line-ups. This should also be a great ball for the mediums like volume and length when you want to control the backend and the SHOW OFF is just too early at the break point. The Winner Solid features the same Altered Hot Shot Core from the Winner, plus the solid version of the same coverstock, and the result is the second coming of the Torrent for me. Very smooth and controllable, good length for a solid but with the traction to really blend wet/dry and hook. For me it seems most at home on difficult conditions or on house shots with really strong backends. It’s been really hard for me to put down unless there’s just too much oil out there or the backends are soft, it’s been a personal favorite of mine since I’ve gotten it and it’s gone everywhere with me. It’s a great compliment to the original Winner as they both feel very familiar, the solid version is just earlier, smoother, and a couple boards stronger. Very highly recommend this one for medium conditions. The Winner Solid is a great step up from the Winner. I loved my Winner, but it was SO long and sideways at times. I sometimes found myself needing an earlier, smoother version of the Winner. The Winner Solid solves that problem. It picks up a bunch earlier and is SOOOOO smooth at the breakpoint. I can see myself starting with the Winner Solid on the fresh and going to the Winner when they breakdown. I drilled my Roto Grip Winner Solid 5.5 x 5 x 5. Just after a first few shots I noticed that this ball is smoother and more continuous than the original. The Winner Solid is just a touch stronger than the Hustle Ink but the Ink has much more response on the back end. This ball will be the first ball out of my bag on those patterns between 38-40 ft or just after my iQ Tour. I set up the Winner solid to cover a light oil/burn spot in my arsenal. I have used the Winner for that to this point and now looking to add a smoother reacting ball. Winner Solid is set up 70x2.5x40 (Winner was set up 70x5x35). Drilled the Winner Solid with a closer pin to pap and higher VAL in hope to smooth out the reaction a little bit. Again, looking for a smoother compliment to the Winner...which has been a great light oil ball for me. Winner Solid is a perfect fit. It gives me the ability to play a few boards right on my normal starting position on a fresh house shot and the option of staying right longer than any other ball in my arsenal. I think the Winner Solid with a short pin to pap, and a little less flare than I am use to, gives me a motion I did not have with any other piece. I highly recommend this ball. Winner Solid and the Winner make a great 1-2 punch on light-med oil. The Roto Grip Winner Solid utilizes the Altered Hotshot Core and VTC-S18 coverstock. I put a shine on the Winner Solid before testing. When compared to the Winner, the Winner Solid reads the mid-lane better. This is to be expected with the solid coverstock verses the pearl. We were about one and one further left with the Winner Solid verses the Winner. The carry with the Winner Solid was very good on the THS during testing for me. Maybe the best I have seen during all the ball reviews. I had three non-carry shots out of about 15 pocket hits – a stoned 8-pin and two ringing 10-pins. The Winner Solid seemed to keep the pins low. Controlling the pocket was not difficult. I have heard others compare the Winner Solid to the Storm Torrent. I did not throw the Torrent but from what I know from those who have, the Winner Solid is better. In fairness to all, I did throw the Winner Solid this past weekend at the Greater Tulsa Open. The ball preformed excellent on the fresh during the singles event but struggled to make the corner on the carry down. Part of this could have been contributed to the control drill I used and the shine I put on the coverstock. This is a great addition to the HP2 line and will make a good benchmark ball. This ball is sneaky good! Visit your local Storm VIP Pro Shop! The Winner Solid is the latest continuation of our HP2 line. The Winner Pearl is very responsive down lane when the lane starts to dry up. The Solid though, is in a class of its own. The Solid HP2 ball is the biggest bang for your buck to date. It reads the midlane earlier than the Winner Pearl and can be used on the heavier volume patterns. The Winner Solid and the Winner Pearl offer similar strength; the difference though is where they read the lane. The Winner Solid is earlier and smoother creating a nice round ball motion. The Pearl skids more and has a sharp motion off the friction making a hockey stick motion. I think the Winners offer a wonderful 1-2 punch for when the heavier volume patterns are in transition from the middle of the block to the end. The Roto Grip Winner Solid is Roto Grip’s newest HP2 line release. The Winner Solid is covered with the VTC-S18 solid cover stock and is finished at 3000 grit matte finish. The Winner Solid has the Symmetrical Altered Hotshot Core which is also found in the Winner Pearl. The Winner Solid is the perfect complement to the Winner Pearl. I drilled both my Winner’s with the pin up and about an inch right of the ring finger with the CG stacked directly below. This has become one of my favorite layouts over the last year or so. Compared to the pearl the Solid for me is about three boards stronger and rolls about 8 feet sooner which gives me a whole different look. The Solid handles fresher patterns better especially patterns that have a higher volume of oil. I have found so far that when I start with the Winner Solid, I can then change to the Pearl and stay in the same part of the lane without too much adjustment. What surprises me the most about the Solid is the fact that I can play deeper on the lanes and still keep a higher carry percentage. This is pretty rare for me out of lower lines of balls. 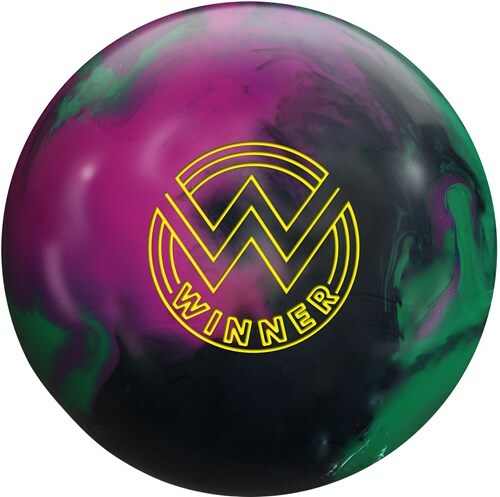 I recommend the Winner solid for anyone looking for a great lower cost ball. The solid is a great benchmark ball and you get much more ball for the money which is a great deal. After making the move down to 15 one of the first balls i drilled was the Winner Solid. This is a benchmark ball in my bag using 4.5 x 35 on this ball it really reads the mid lane for me and is a great ball to keep you in the pocket. I can get left and change my angles and this ball just keeps going for me. If you haven't had a chance to try this ball i would talk to your local pro shop about it. Great ball for the price point. A nice step up from the Hustles. After having success with the original Winner, it was only natural we’d see a solid version of it. I expected a very mild, smooth reaction with a slower response time. That’s exactly what the Winner solid is meant to be. I’ve noticed the Winner solid is a solid compliment to the Halo and Code X type balls after they start to get flat or run out of gas. With a 3000-grit surface, the Winner solid still goes through the pins nicely without burning up. I tried a different layout on this one and think it rolls great. I used a longer pin and put it pretty far above my bridge. The layout maps out as 6 x 5. The pin is about 4 inches above my bridge and I wanted to see how well it would roll with a good amount of finger weight. I think it gives the Winner solid a good response time and doesn’t slow it down at all. I’ve been able to play straight or open up my angles without a problem. If I don’t feel like the Winner solid is enough down lane, I can go to my original Winner. The Winner solid is a perfect addition to the HP-2 line and can be used on multiple lane conditions. After the success of the Winner, Roto Grip decided to wrap the powerful Altered Hotshot™ Core in a solid coverstock called VTC-S18™. The Winner always suprised me with it's strong down-lane move. It was so core strong that I wondered if wrapping it in a solid cover would be overkill. The answer turned out to be yes.... and no. The Winner Solid is cleaner than I expected it to be. The cover gives you some pretty decent midlane reaction, even in a little higher volume. It's definitely smooth and readable but it still hits. I really like using the Winner solid to play straight into the oil on my weekly league. High Volume house that feels very wet down-lane. Stronger equipment can kind of trap you on the fresh because you have to be steep through the front to have hold, yet you can't get it to far right or it struggles to recover. Going with more cover tended to burn up the mid-lane making me use more and more angle and not burning up the out of bounds area fast enough. The Winner solid is strong enough to not miss the spot if I go straight into the Out of bounds area, but it allows me to keep my angle straighter through the front. The result is a first game where i can not only break the right side of the lane down without disturbing the mid-lane, but I can expect to score. The Winner solid will also retain energy pretty well in a house with a more defined area of friction to the right. You feel the strength of the core much more when theres a spot to throw it at. I was surprised that I had to open my angles more, but even with the solid cover grabbing the mids it still retained enough energy to go through the pins. I think the Winner solid is a great ball to use for creating friction on tough patterns, because you don't have to open up angle and it's still strong enough to get back. It's also versatile enough to be useful on house patterns. It's definitely a great value ball for those people who are looking to move into their first reactive ball and want something strong enough to help them see motion right away, but affordable. The VTC-S18 Cover is combined with Altered Hot Shot Core which is also in the Winner Pearl. The Winner Solid in my opinion is perfect for medium volume shot’s that are longer in length. A very smooth rolling ball with a higher RG that allows the ball to easily get down the lane. The Winner Solid is a great Symmetrical ball and a perfect addition to the HP2 line. I would also recommend as a very good benchmark ball. Page created in 0.742 seconds with 23 queries.